Use to close bags using metal twist tie or tape. The Twist Tie Machine is capable of tying up to 50 bags per minute, the superior design and compact size has made it perfect for all applications, including: bakery, food, candy and confectionery. 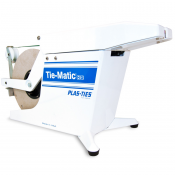 Bag Tapers tapes bags in one quick and swift motion with Self-Adhesive Colored Tape, for qualification purposes.